Squaring and taking square roots in your head (or on paper for that matter) is a hassle, but if the two standard errors are about the same, we can approximate this as , which is a particularly useful approximation. The reason is that the 95% CI for is (i.e., 6 of our “original” standard errors). As such, we can construct the 95% CI for the difference Greek-geometer style, by taking the origin CI, diving it into 4ths and then adding one more SE to each end. 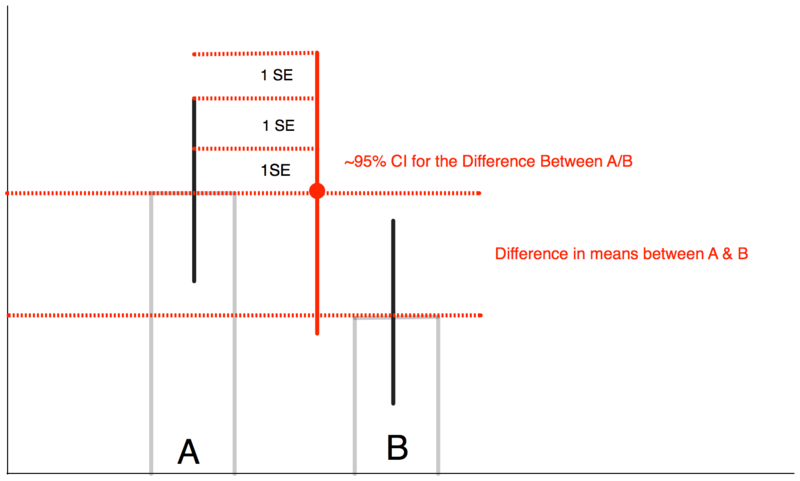 The figure below illustrates the idea – we’re comparing A & B and so we construct a confidence interval for the difference between them, that is 6 SE’s in height. And we can easily see if that CI includes the top of B. What if the SE’s are different? This is just the Taylor series approximation of the correct formula about (and using and ). This entry was posted in Uncategorized on December 16, 2015 by johnjhorton. Suppose you run a website and you have some experience or feature that you think might be good for some subset of your users (but ineffective, at best, for others). 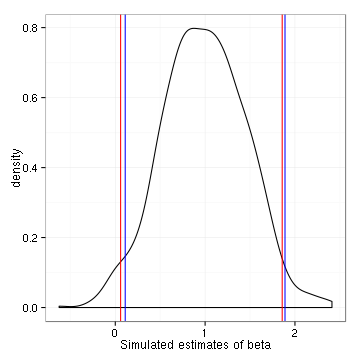 You might try to (1) identify who would benefit based on observed characteristics then (2) alter the experience only for a targeted subset users expected to benefit. To make things concrete, in some cities, Uber offers “UberFamily” which means the Uber comes with a car seat. For us (I have two kids), UberFamily is awesome, but the option takes up valuable screen real estate and for a user that Uber thinks does not have kids, adding it to the app screen is a waste. So Uber would like to both (a) figure out if it is likely that I have kids and then (b) adjust the experience based on that model. But they’d also like to know if it’s worth it in general to offer this service even among those they think could use it. This isn’t the example that motivated this blog post, but it makes the scenario clear. If you are testing features of this sort, then you want to both (a) assess your targeting and (b) assess the feature itself. How should you proceed? I’m sure there’s probably some enormous literature on this question (there’s a literature on everything), but I figure by offering my thoughts and potentially being wrong on the Internet, I can be usefully corrected. 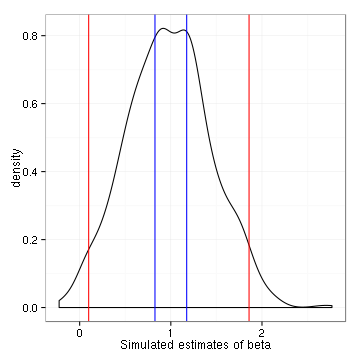 I think what you want to do is not test your targeting experimentally but rather role out the feature for everyone you reasonably can than evaluate your targeting algorithms on your experimental data. So, you would run the experiment with a design that maximizes power to detect treatment effects (e.g., 50 to treatment, 50 control). In other words, completely ignore your targeting algorithm recommendations. 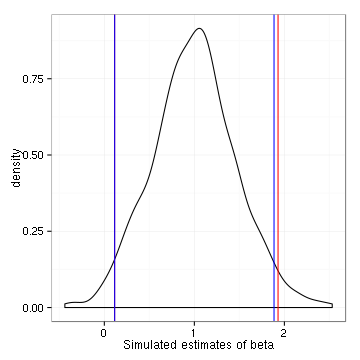 Hopefully, if the treatment was better for people the model thought would be helped, then should be positive (assuming the y is such that bigger is better). You’d also want to finding the minimum score such that you should be targeting people i.e., the score such that the expected benefit from targeting is first positive. 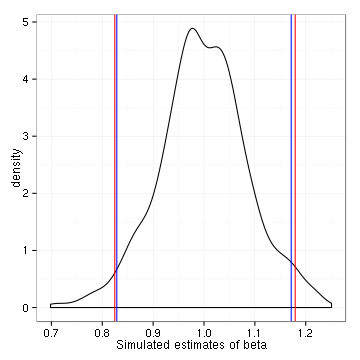 You can then simply select the algorithm with the greatest expected improvement, given the minimum score for targeting. This seems like a reasonable approach (and maybe bordering on obvious but it wasn’t obvious to me at first). Any other suggestions? This entry was posted in Uncategorized on December 7, 2015 by johnjhorton. When I write a sentence, there’s about a 10% chance it will have typo or grammatical error of some kind. It’s often painful to find them later, as like most people, I tend to “fill in the gaps” or glide over typos when reading my own writing. Fortunately, this kind of editing, unlike, say, reading for structure or consistency, is very parallelizable. In fact, reading each sentence alone, out of order, might even be better than reading the whole document, sentence by sentence. After splitting the sentences, I went through the CSV file to remove blank lines and LaTeX commands by hand, though one could easily add this feature to the script. Overall, I think it’s a successful experiment, though it was already well known that MTurk workers can do editing tasks well, from soylent. This entry was posted in Uncategorized on December 2, 2015 by johnjhorton.